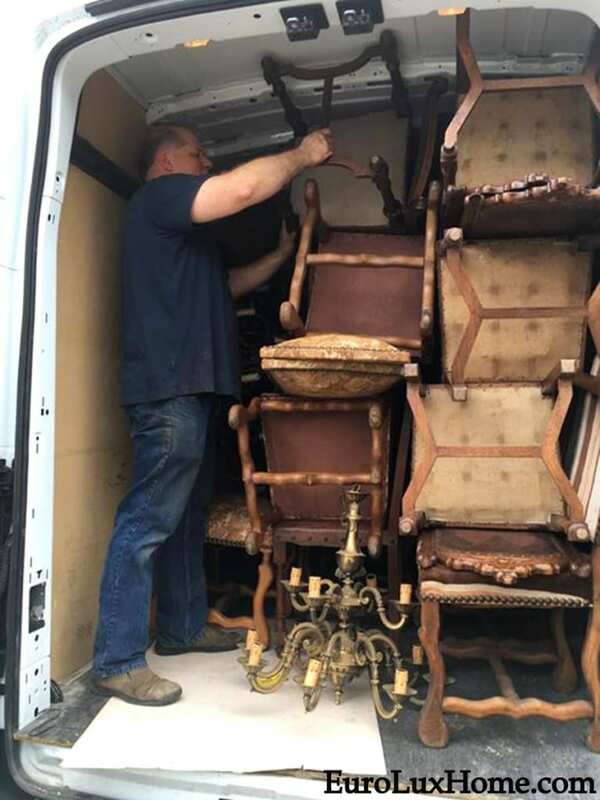 We were very happy to find some treasure troves of antique and vintage chandeliers. Soon the numbers mounted up…. 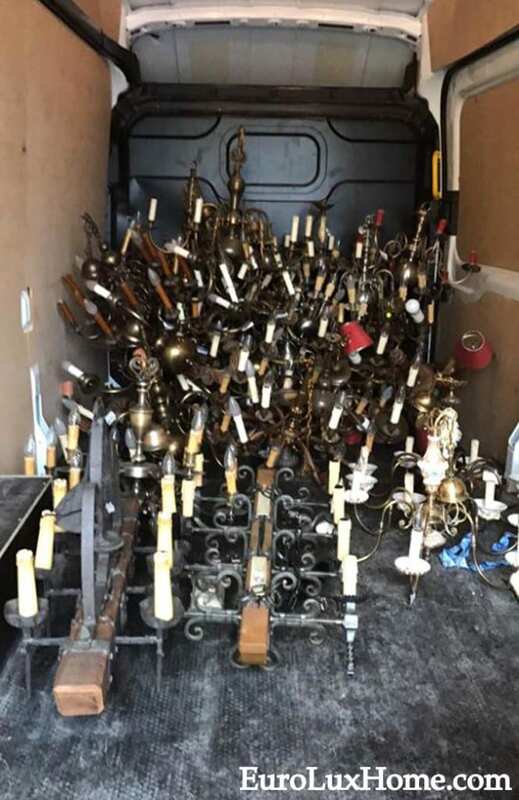 As Greg said (sang): “30 chandeliers on a pile in the van, 30 chandeliers on a pile, take one down and sell it online… 29 chandeliers on a pile in the van.” By the time we finished buying vintage chandeliers in Belgium, we had 85 chandeliers in the back of the van! I also bought the largest blue Delft vase we’ve ever seen – 2 1/2 feet tall! 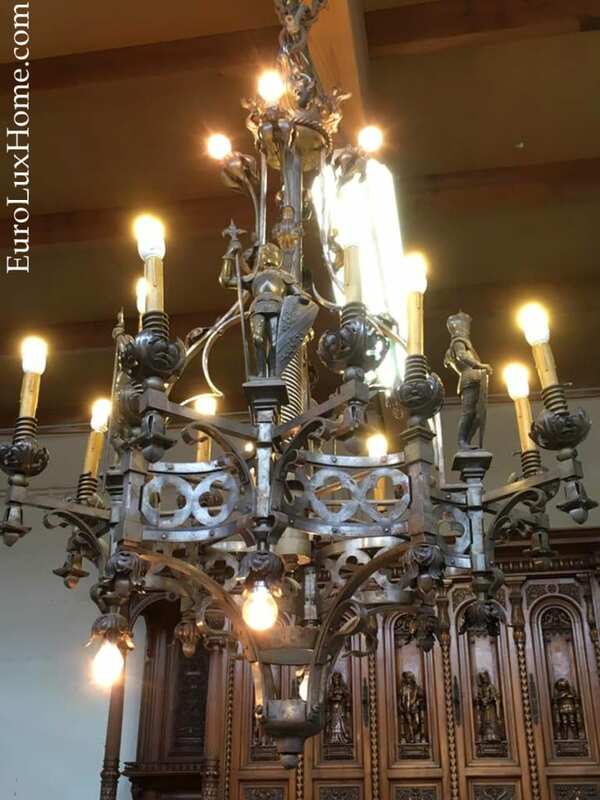 And I love all the details in this amazing antique Renaissance dining set with a Gothic iron chandelier. We bought it all to ship back to the USA because we know our customers will love these pieces. 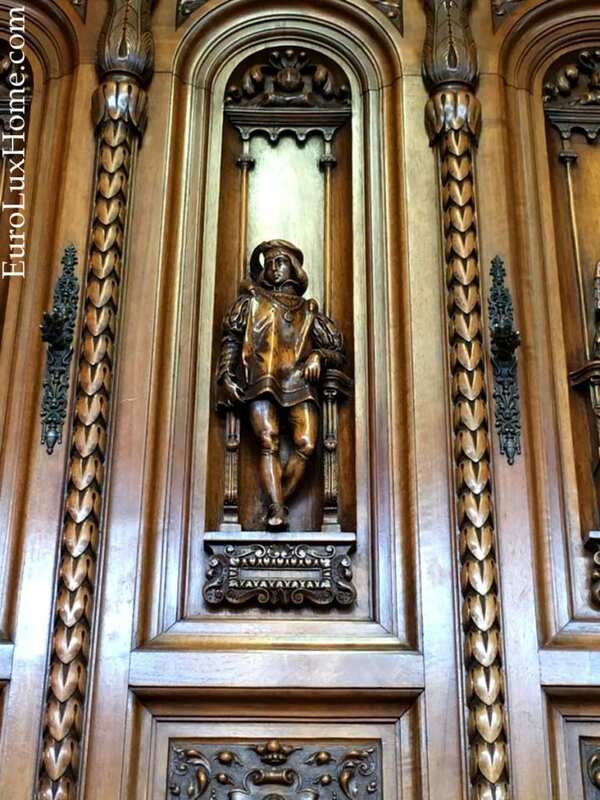 This is a close-up of one of the carvings on the enormous antique Renaissance buffet. You will notice how fine the detail is. You can almost see the movement in the gentleman’s tunic. Now Greg had an even bigger packing job on his hands, between all the chandeliers and furniture. Could he fit everything in the van? You bet he could! Greg has mad truck packing skills. I’d back him against anyone to get the largest quantity of fragile and beautiful antiques packed safely and tightly in the fastest time. Greg says that his superpower is probably from all the Tetris he played as a kid. 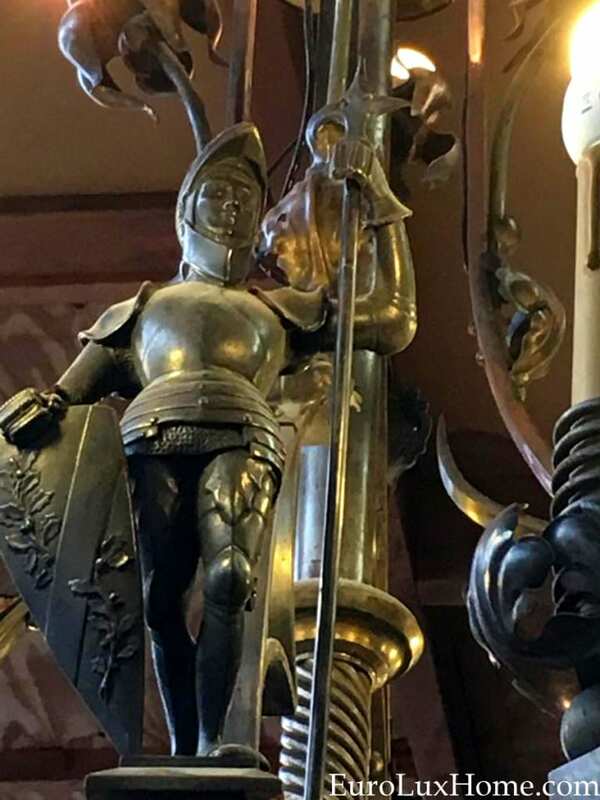 In our next adventure in Belgium, you can see some of the wonderful religious treasures that we found, which have a surprising story behind them! 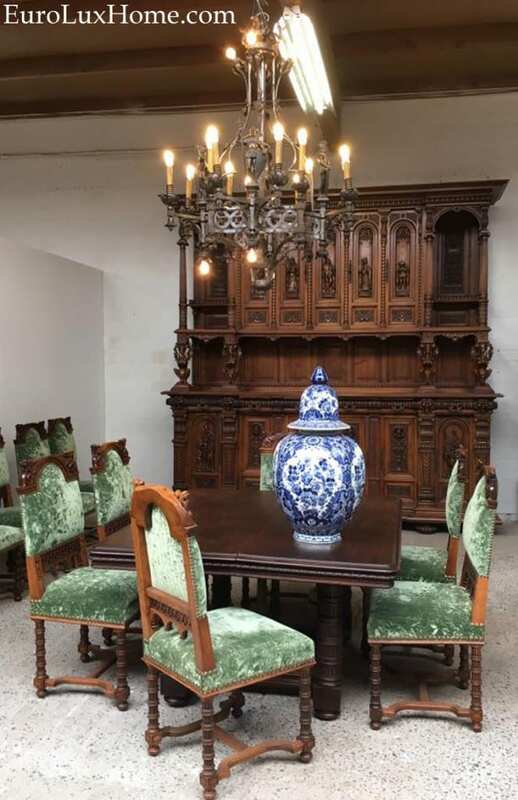 This entry was posted in Antiques Buying Trip and tagged Antique Chandeliers, Antique Lighting, Antiques Buying Trip, Antiques Shopping, Antiques Shopping in Europe, belgium, Blue Delft vase, Flemish Candelabra, Vintage Chandeliers, Vintage Lighting on July 22, 2017 by admin. Best of May 2015: Castles, Gold, and Chandeliers! We started our treasure hunt with a look at the interior design trend spotted at the Maison & Objet 2015 show in Paris: gold, gold, gold! 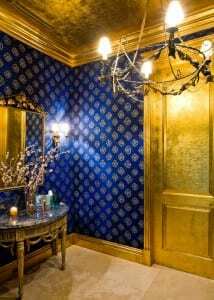 Gold diggers will love the warm and opulent effects in the Home Trends: Gold Decor Creates a Glow story and photos. But you don’t have to go crazy with the Midas touch if you just want a little gold rather than an all-over look. A few gold accents in your decor still add a vibrant and luxurious effect. Next we went hunting for English history, lore and legends by taking a peek inside some incredible English Castle Hotels. If you want a unique and romantic vacation, staying in an English castle is bound to make you feel like royalty! You can even stay in the double-moated medieval castle that was home to Anne Boleyn when she was a girl, before she became the second wife of King Henry VIII. Back at home, our own vintage 1920s bungalow is our castle and we’re delighted with all the progress we’ve made on the renovations. We’ve worked hard on the garden landscaping, as you can see in the before and after photos in my story on Vintage Life: April Showers bring May Flowers! As well as adding new planters that belonged to Greg’s great grandmother – family heirlooms for blooms! – we added hanging baskets, bird feeders, bird baths, and I built a rose bed around the mailbox out of vintage bricks. We’re also proud of the edible treasures growing in our raised bed garden boxes. See all the photos here. 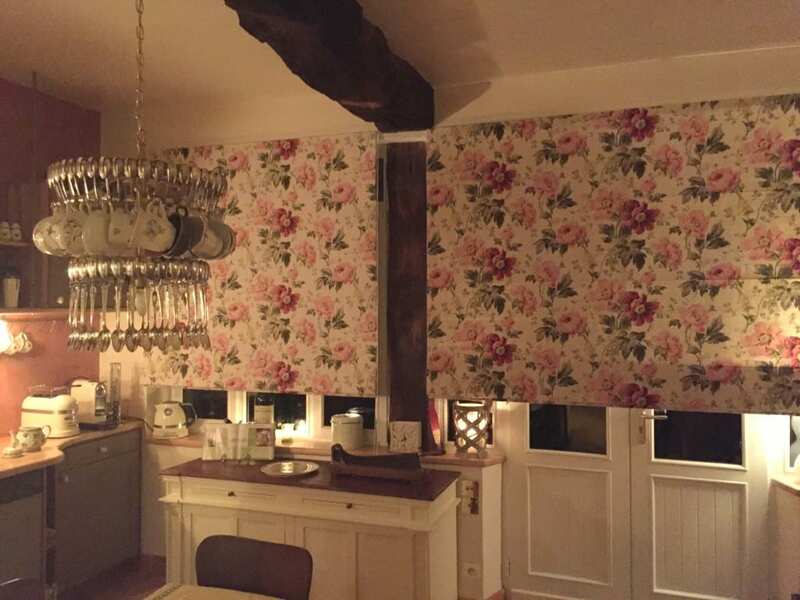 I loved the photos sent by our customers for our two client spotlights this month. The first showed how wonderful this Woodbridge Game Table in antique French style looks in Marie-Regina’s home in Pennsylvania. The 18th century French style table is crafted in solid wood and hand-rubbed for a beautifully distressed finish. The photos of Marie-Regina’s living room make it look like a cozy place to spend a few hours playing cards! 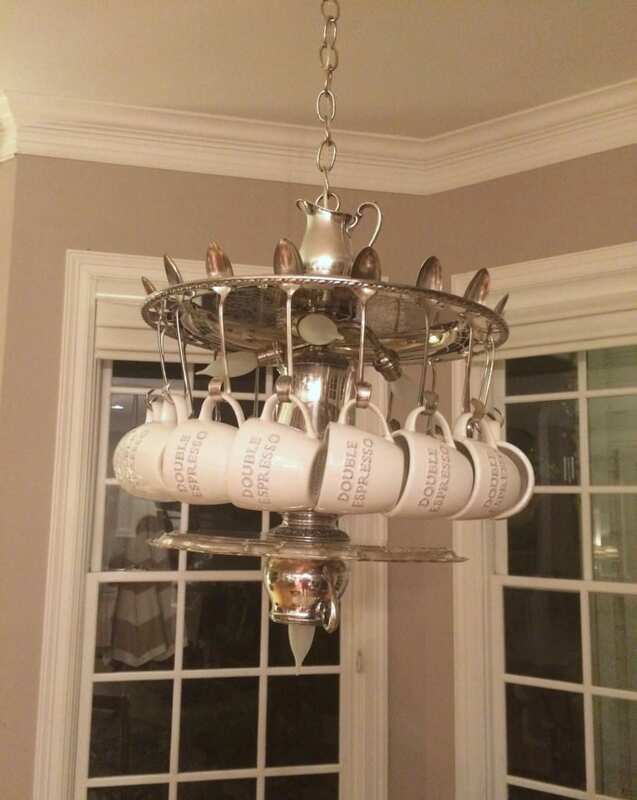 Finally, clever Kelley in Texas added her own personal touch to the custom-made tea party chandelier that she bought from us. 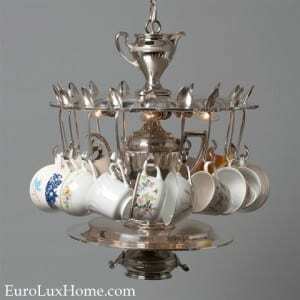 The chandelier is crafted from a vintage tea service, right down to the silver plated spoons and teacups. 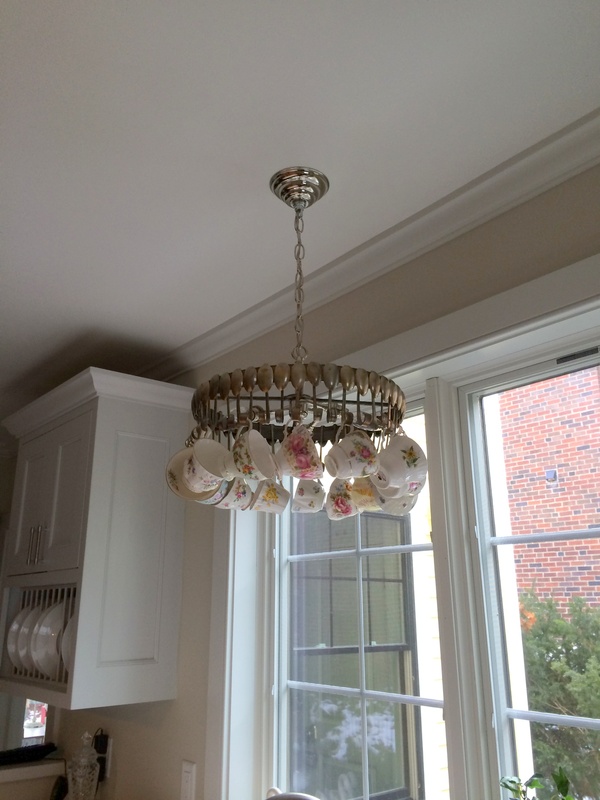 Kelly transformed the light by swapping the vintage tea cups for large double espresso coffee cups! 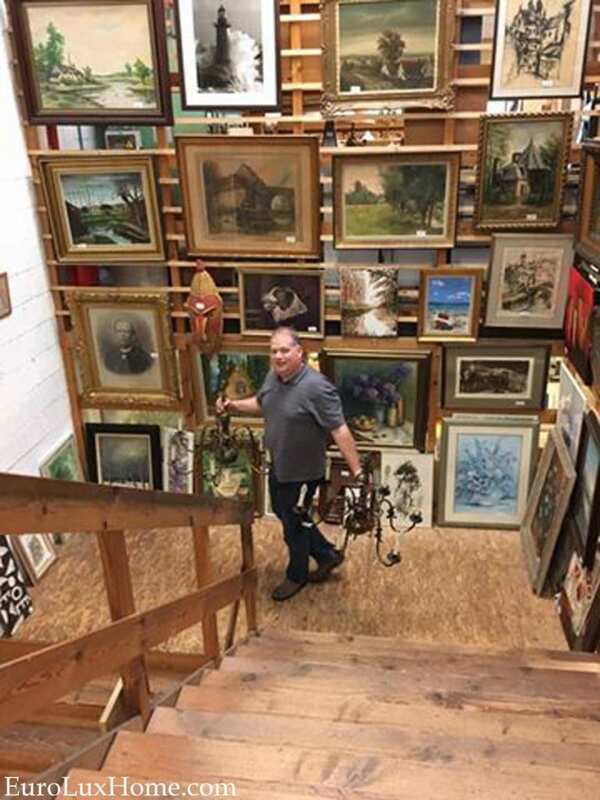 We hope you’ll stay reading through June, when we’ll show more photos of customers’ homes and share more gorgeous antiques and inspiring home decor ideas. 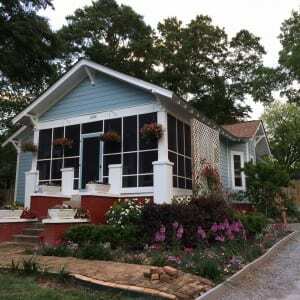 This entry was posted in Home Design Ideas, News and tagged 1920s bungalow landscaping, creative home decorating, home decor, home decorating, interior decor, interior design, Vintage Lighting, Woodbridge Furniture Company on June 1, 2015 by admin. February is the month of romance, and our client spotlight posts about vintage decor this month were certainly full of romance. February also ended on a romantic note for Greg and me – we took a break away from business with a trip to Hot Springs, North Carolina! Here are highlights from some our of favorite blog posts of the month. 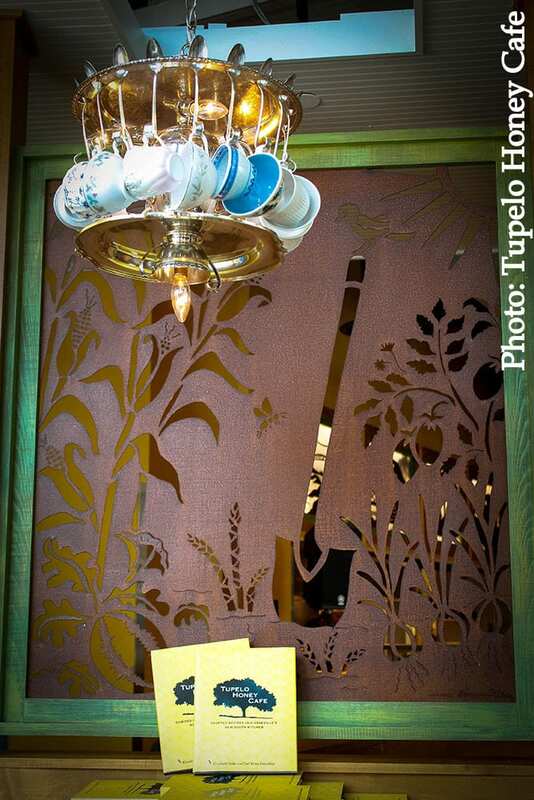 Our customer Marie-Louise in Haute-Normandie, France, bought a vintage teacup and spoon chandelier from us. 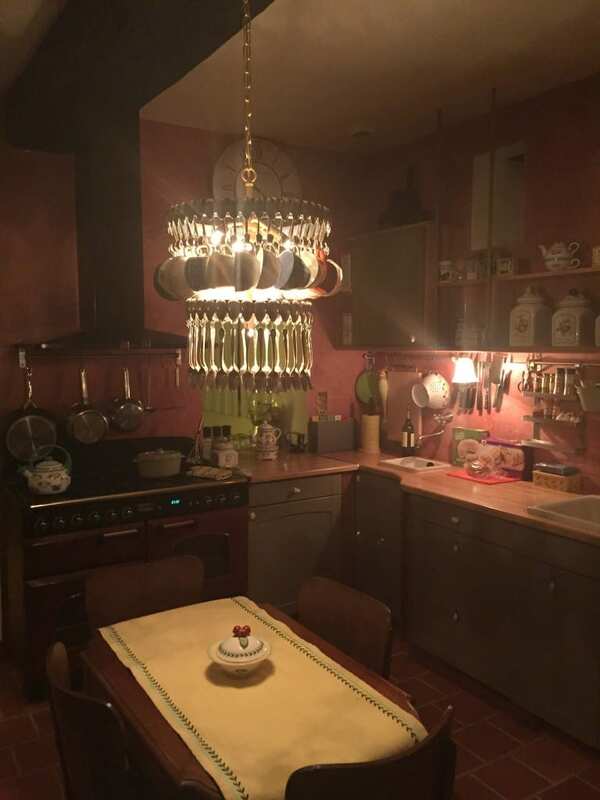 You can see all the photos Marie-Louise sent us of the chandelier in her gorgeous vintage French kitchen in the story about The Vintage Teacup Chandelier. This is just one of our many upcycled chandeliers, hand-crafted and custom-made for us by an artisan using vintage silver plate spoons. 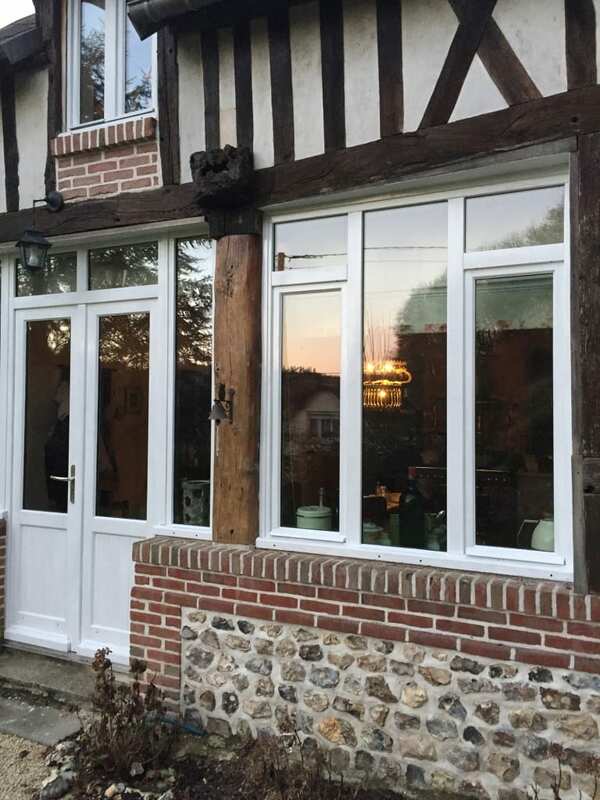 Marie-Louise’s home is dreamily romantic, inside and out! 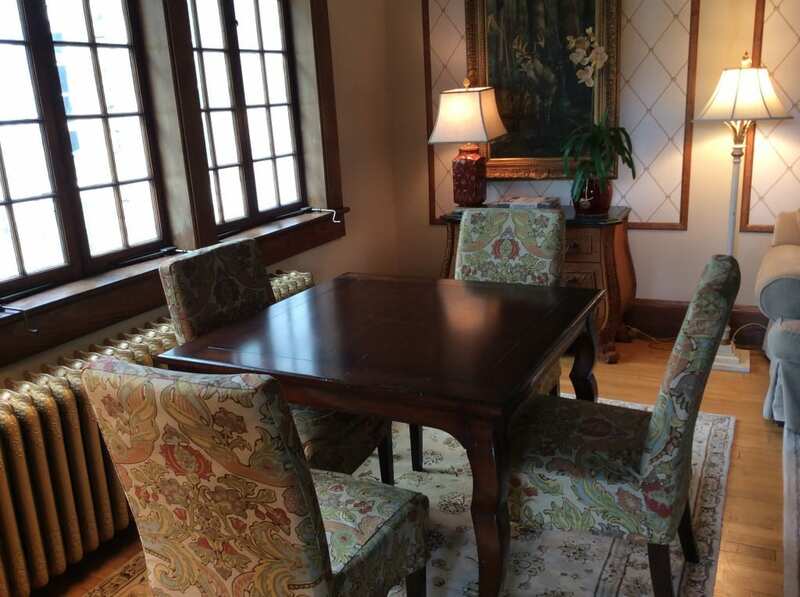 Closer to home, Veritta in California sent photos of her dining room featuring the set of six vintage French dining chairs she bought from us. The upholstered oak chairs date to about 1950 and they are carved in the sheepbone style. Veritta told us that she bought the dining table 10 years ago but she has been waiting all this time for just the right chairs. We think it was worth waiting for the perfect love match, don’t you? 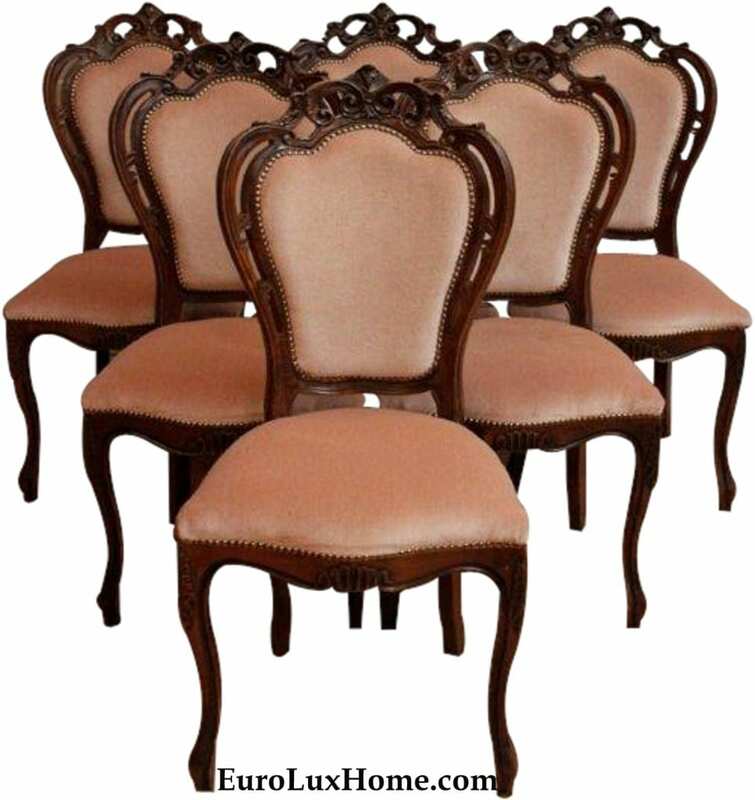 See for yourself in the Vintage French Sheepbone Chairs story and photos. Also in February, I told you about these Four Romantic Victorian Inns around the country so you can plan a romantic getaway any time of year, not just on Valentine’s day. 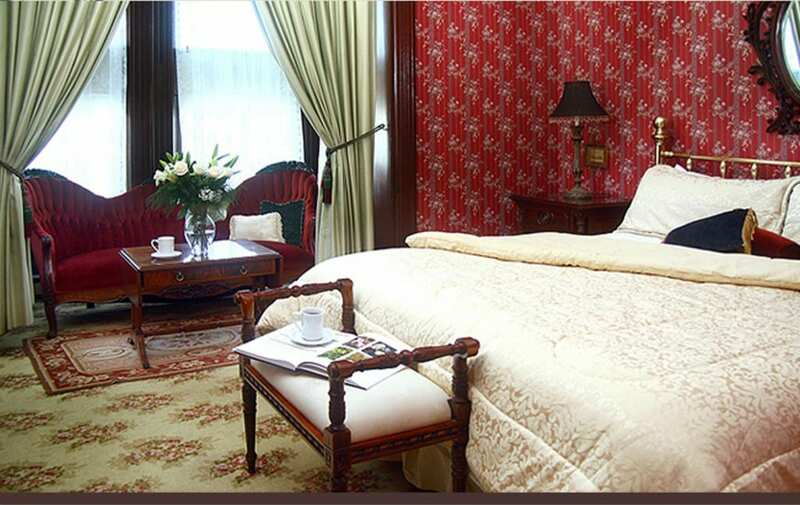 All the inns are decorated with period Victorian or Victorian style decor, including the one in the photo. This is The Victorian Inn in Ferndale, CA, built in 1890 and convenient for California Redwood Forest. An antique armoire and a red velvet Victorian couch add to the appeal of the inviting Victorian Parlor room. I often talk about home decor trends in this blog, and one romantic trend that I’ve noticed for 2015 is bird imagery and bird themes on furniture, textiles, ceramics, and home accents. My article called Home Decor Trends: Birds Take Flight shares bird decor inspiration from the charming and rustic to the elegantly sophisticated. Let me know if there is a topic you would like me to cover in the March blog posts, whether it’s about antique furniture, vintage decor, or home decor trends. Or anything else related to making a beautiful home – we love to hear from you! 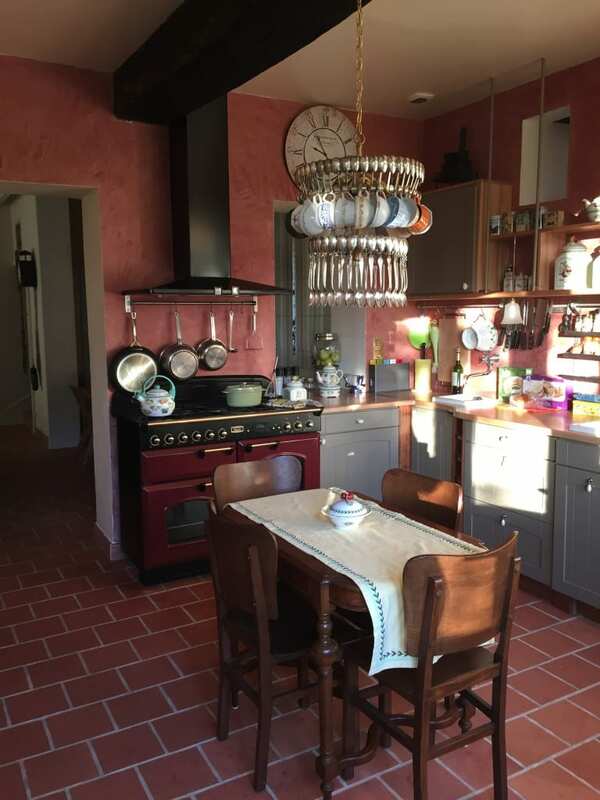 This entry was posted in Antique Furniture, News and tagged Antique Furniture, Antiques Blog, creative home decorating, French Vintage Furniture, interior decor, interior design, living with antiques, Vintage Lighting on February 28, 2015 by admin. Chandelier lighting makes a wonderful design statement in any room. 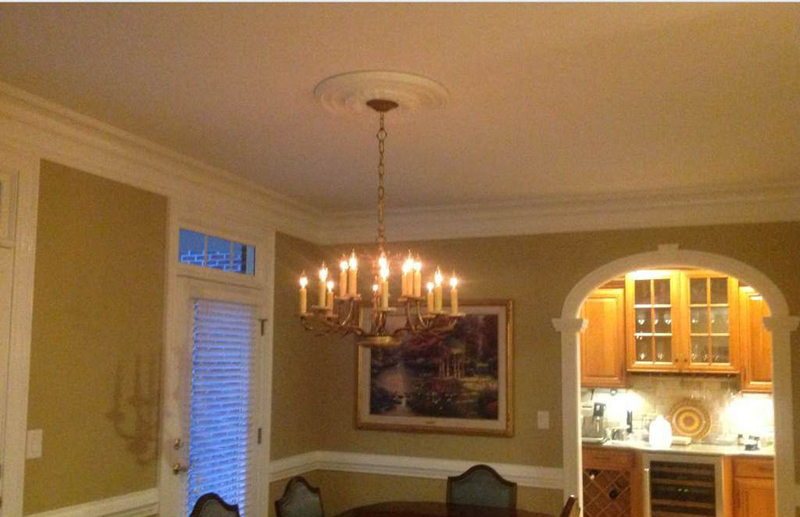 Some people think you have to have a formal dining room to show off a chandelier. 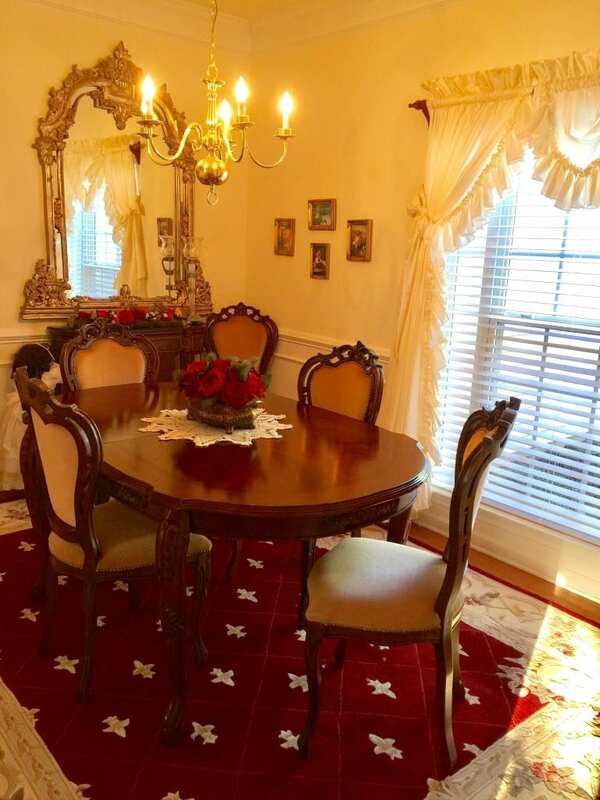 (For example, see the dining rooms in our client spotlights on Gail’s French vintage Rococo chandelier or Gary’s Art Nouveau chandelier.) 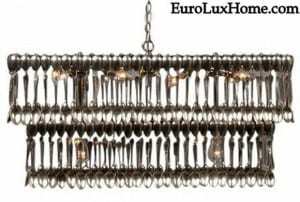 Others like to use chandelier lighting in an entry way or foyer. A little razzle dazzle creates a sparkling welcome! 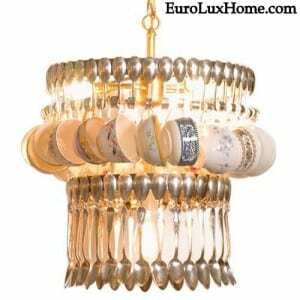 But you can enjoy the beauty of a chandelier in any room from the bedroom to the powder room. The crystal swagged chandelier in this traditional kitchen adds a very individual touch, doesn’t it? 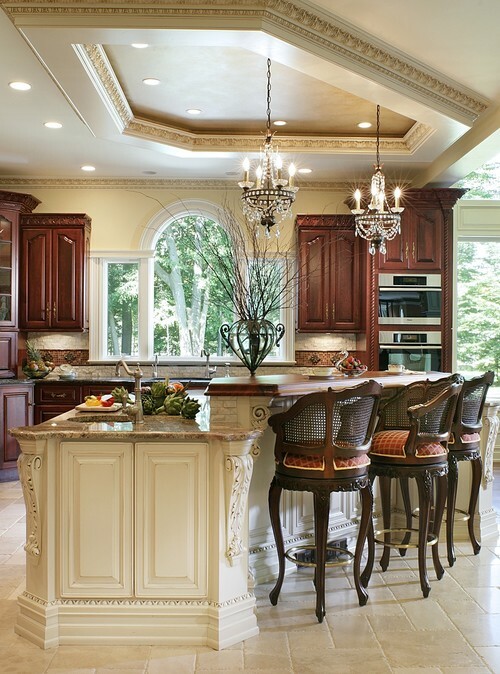 Traditional Kitchen by Northvale Design-Build Firms Creative Design Construction, Inc.
We stock a huge selection of chandelier lighting in our online gallery. The choices range from antique and vintage chandeliers to new chandeliers hand-crafted by artisans. Let’s have a look at some of the chandelier style options for every room and every taste. Do you prefer streamlined shapes rather than the more elaborate swoops, swags and flourishes of fancier Rococo styles? 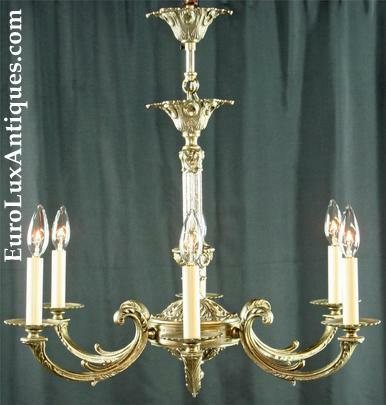 Then this 1950 vintage French chandelier shows you can have ornate style without the frou-frou details! 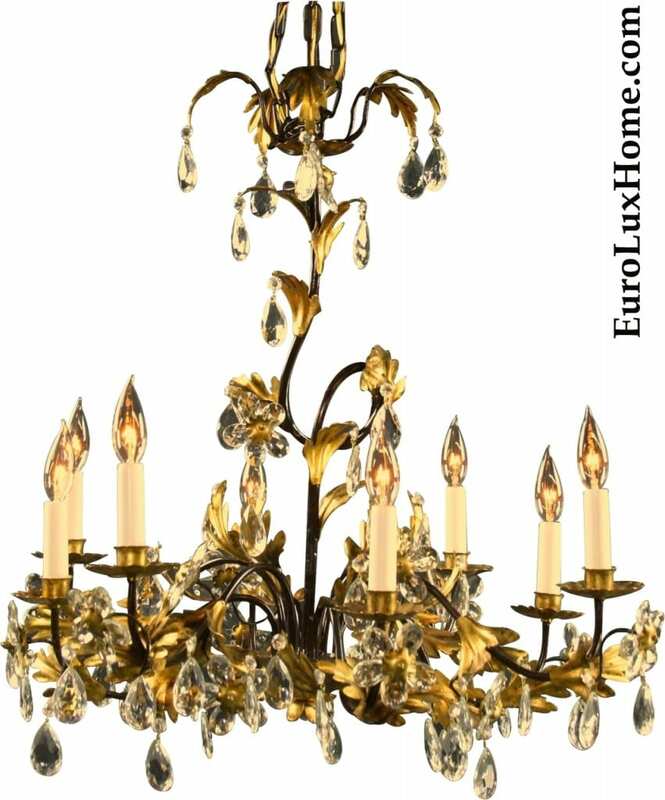 The metal chandelier is crafted with a light golden finish. The 6 arms boast a graceful leaf motif. The body has an ornate embossed look too. It’s stately and elegant, and would look terrific in a living area or dining room, or even in a hallway. When hanging chandelier lighting in areas where people will walk beneath, be sure to leave at least 7 feet from the ground. If you have a tall visitor with a bouncy step, you don’t want them banging their head! 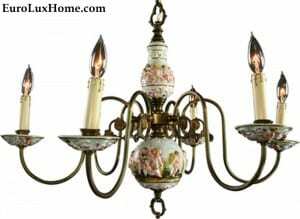 If bling is simply not your thing, a ceramic chandelier like this darling vintage Capodimonte one is a pretty choice for a Victorian home or cottage. 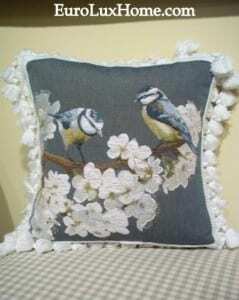 Or even for a modern shabby romantic bedroom or dressing room! 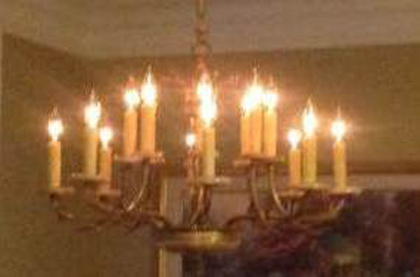 The Italian chandelier is a petite 20 inches wide and 17 inches tall so it will fit nicely into a smaller space. 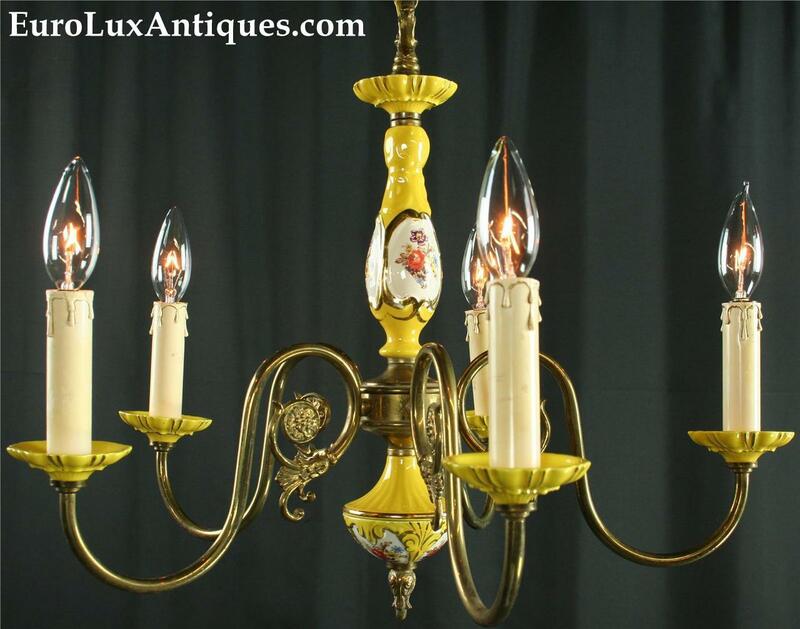 But even though it is petite, the yellow 1950 vintage Capodimonte chandelier is full of cheer, painted with flowery panels. 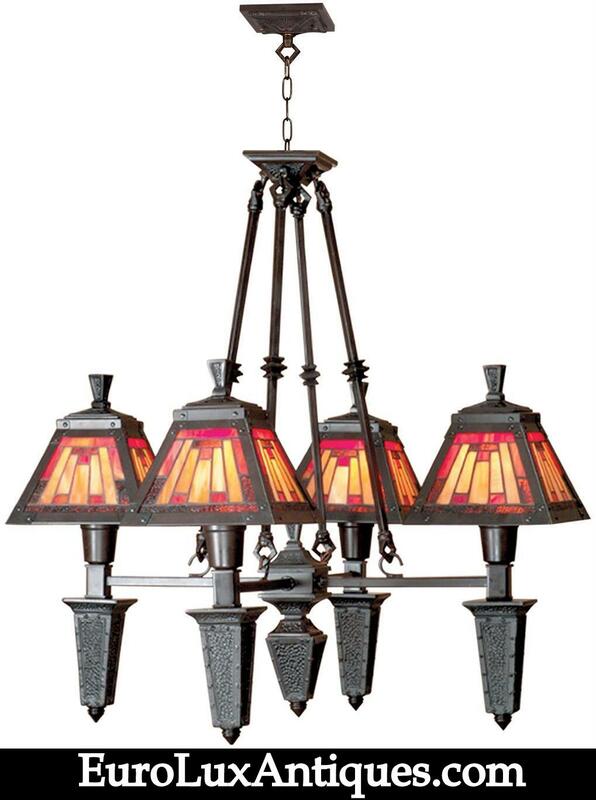 Believe it or not, this Dale Tiffany Mission style chandelier is not actually an antique. 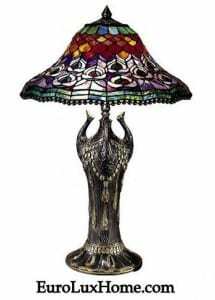 It is crafted by Dale Tiffany artisans in hand-rolled art glass with a bronzed metal base. The size and heavy look make this light a good fit for a larger room. Think about a great room or a high-ceiling foyer where it will balance the room scale nicely. 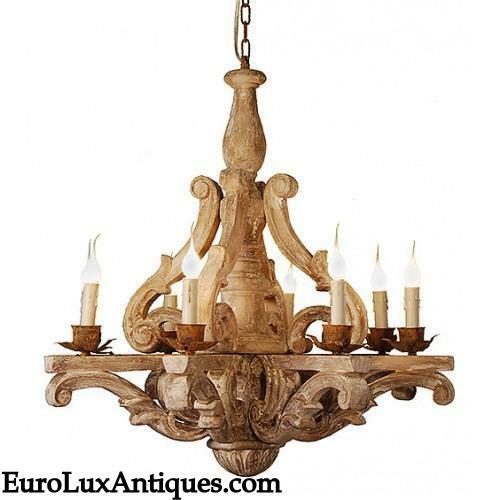 This rustic hand-carved chandelier is also newly crafted. The style is so adaptable that we could see it in a Scandinavian design scheme or in the decor of someone with a taste for folk art. Picture it in a country cabin, a Farmhouse kitchen, a Boho chic boudoir… the possibilities are endless. Each of the 8 hand-carved scroll arms supports a narrow shelf with candle cups and electric candles. Charming! 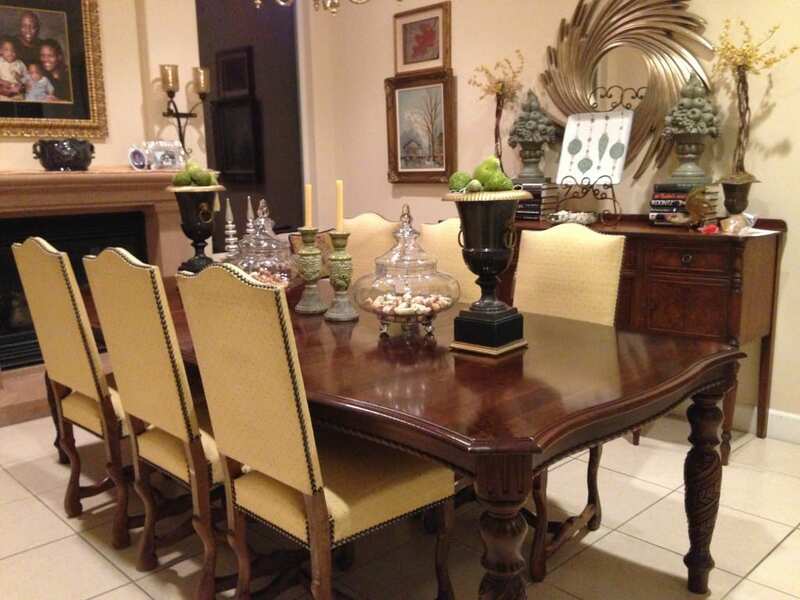 If you hang this or any chandelier over a dining table, allow at least 30 to 33 inches clearance above the table top. Finally, those of you with eclectic taste (or a love for tea!) 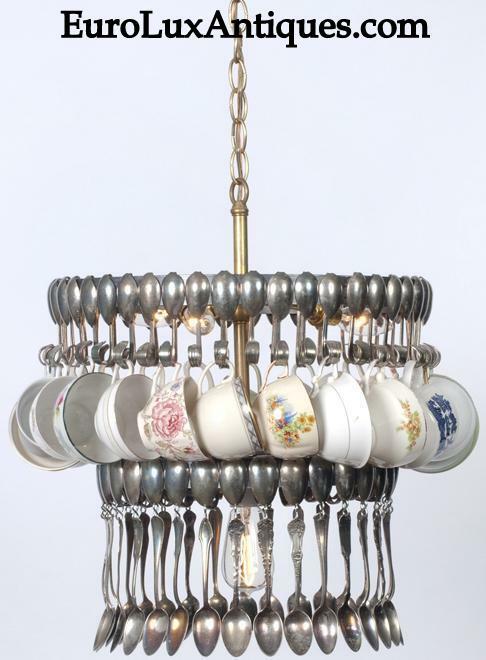 will enjoy this upcycled vintage spoon chandelier. 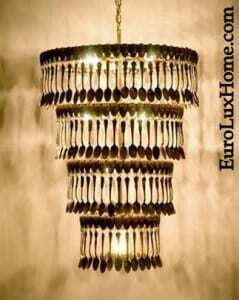 It is hand-crafted by an artist using vintage silver plate spoons. 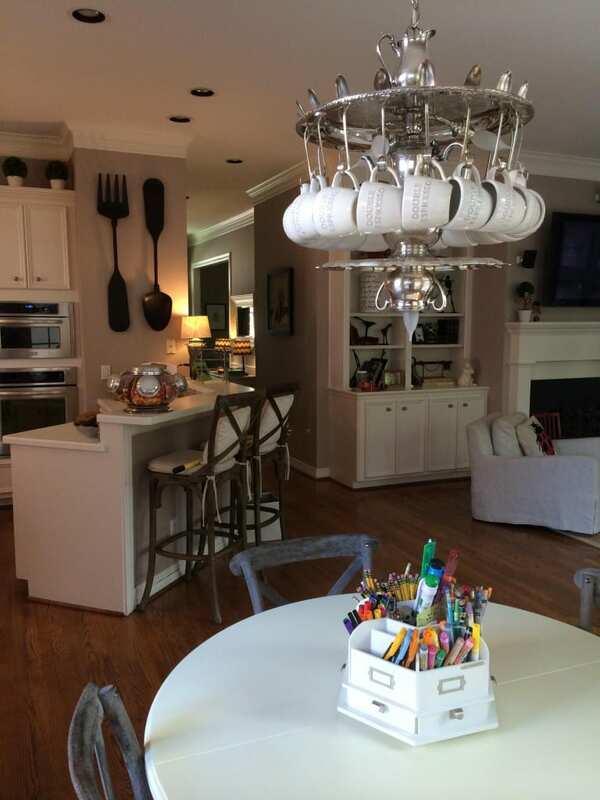 You can see how fabulous it looks in our customer spotlight about Barbara’s kitchen featuring a custom-made spoon chandelier. 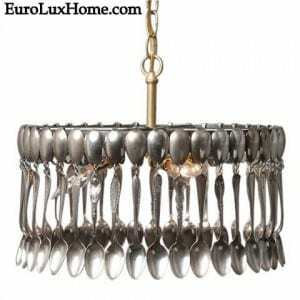 Fun and unique, the upcycled lighting would look delightful in a breakfast nook or your cottage kitchen. 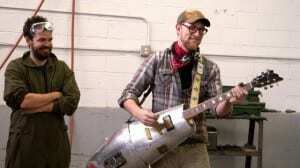 I can also imagine it as an entertaining addition to a guest bedroom. It will bring a smile to any visitor’s face and make them feel quite special and welcome! 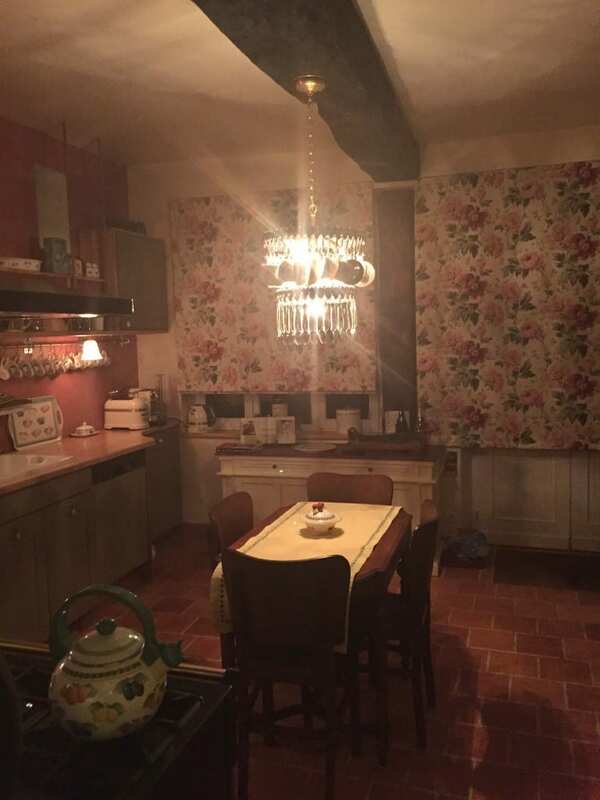 So here’s the Chandelier Challenge – just for fun. Describe your room or show us a picture and we’ll suggest a chandelier to suit it! 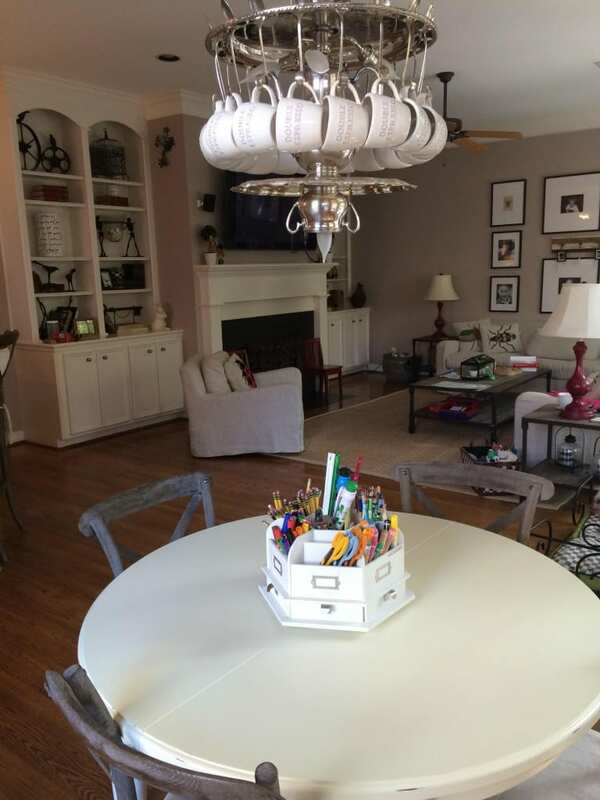 This entry was posted in Home Design Ideas, Vintage Lighting & Chandeliers and tagged Antique Chandeliers, chandeliers, Dale Tiffany, Spanish Mission Design, Tiffany chandelier, Vintage Capodimonte, Vintage Chandeliers, Vintage Lighting on June 11, 2014 by admin.